Tourist-Channel Slovakia - Kráľovce-Krnišov Tourist-Channel Slovakia: New homepage! The earliest historical reference for Kráľovce - Krnišov dates from 1266 which means that the village is a typical example of one of the oldest villages in the region. 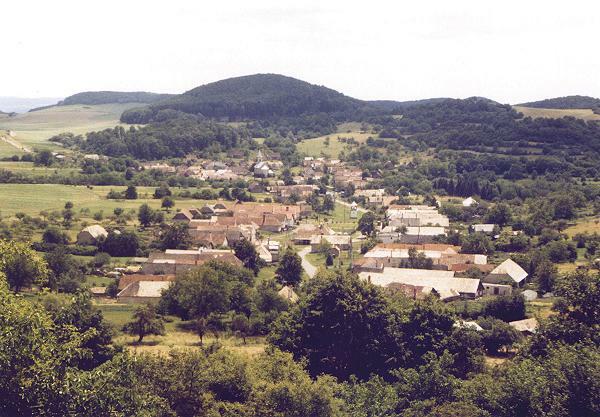 The village is situated in the micro region of Južné Sitno and spreads over the protected area of Štiavnické vrchy. The easiest way to approach this village is by the road No. 525 which starts in the town of Banská Štiavnica, goes through valley of Štiavnica river and joins the crossroads at Hontianske Nemce. From this crossroad, the roads then continue to Zvolen (via Krupina), second to the spa town of Dudince and continuing further to Hungary and the third to the western side of Slovakia (via Levice). Tradition of local viticulture - the village has always grown grapes and produced local wine. Special wine cellars under wine houses were used for grape storage. Despite of the modern development in the village, there are still some examples of the local architecture such as houses with wooden roofs, typical gables and hand made carpets, stone columns supporting gates, ornamental sculptures, stone window frames and traditional churchyard stones, hand crafted gates and metal ornaments on windows. There is also a village well containing high quality water, which is still used in the households. The neo gothic church dates from 1794 and was rebuilt in 1911. Local delicatessen and specialties: egg mash called "baba", small sweet pasties and strudels filled with jam, poppy seeds, sweet cheese or crushed nuts. Prof. Samuel Stankoviansky - scientist in the area of analytical chemistry who cooperated with prof. Hezrovský who was the recipient of a Nobel award.